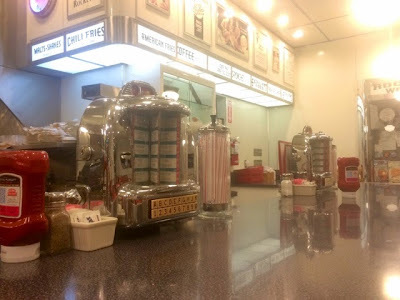 During my trip to California I paid a visit to Johnny Rocket’s, a diner chain that embodies the classic 1950s Americana feel that we all imagine when we think of American diners from the movies. The red leather stools and booths, vintage posters and typefaces used on the menu alongside the juke boxes make this place a really great novelty for the average Brit visiting the States and we all thoroughly enjoyed the experience. The food is hamburgers, hot dogs and philly cheese steaks of course, with a selection of sides and milkshakes. The slightly depressing thing about the menu is that the number of calories in each dish is printed next to every single item, which sort of makes you want to have a heart attack then and there. You really have to completely ignore it as, if you’re really concerned about the number of calories you’re consuming, you simply cannot eat here. 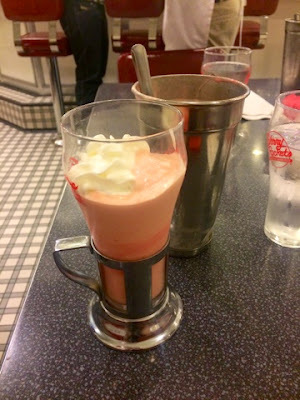 I kicked things off with a strawberry milkshake which was creamy and sweet and lovely. It was served up in a cool little cup with the extra brought up so you can top it up yourself. My burger did not arrive particularly beautifully presented, but Michelin star presentation isn’t exactly what I’d expect from this type of joint, it was however neatly tucked into a little parcel preventing the filling from seeping out all over the place. The Rocket Single with bacon came with cheddar cheese, iceberg lettuce, fresh tomato, white onion and special sauce and sort of tasted a little like a Big Mac but done way better. The fillings were all pretty generous too. Sweet potato fries were definitely preferable to the American fries, crispy and more flavoursome I’d pick these over normal french fries any day. 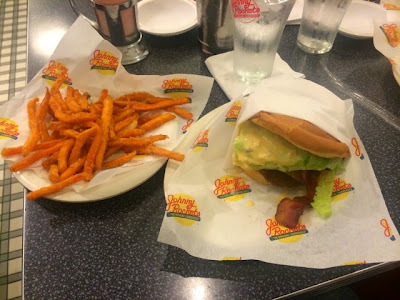 Johnny Rocket’s was a really great experience and really tasty food. I wouldn’t hurry back as the calorie count was so astronomical. It’s just one of those things you’d rather not know. 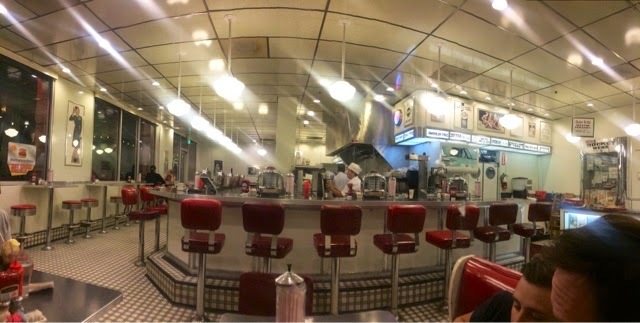 However, the whole American 50s style diner vibe was really cool and great for a tourist who wants to take pictures and pretend they’re on a Hollywood movie set!